Many stock traders often ask me how many stocks to own and how many stocks in portfolio do I have typically. The answer to this question depends on your trading style. Day traders will apply rules different from position or swing traders. Why to define how many stocks to own in my portfolio? Why is it important to think about limiting how many stocks to have in your portfolio? You can read a lot about diversification, but I don’t believe that it is the primary and the most important reason. I believe that the substantial reason to limit how many stocks to buy or short sell is to manage your risk. Risk management is the key to long-term success with any stock trading style. You should use simple but straightforward rules that help you decide whether you can open another position. These simple risk management rules help you also with position sizing. Knowing generally how many stocks to buy or short sell is fine, but you also have to apply this according to your distinct account size. 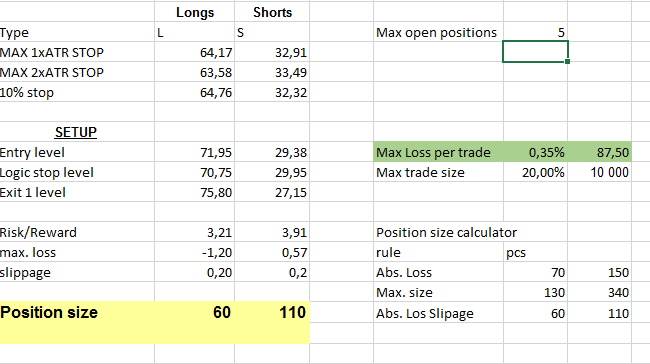 A trader with $400K account size will trade position sizes different from a swing trader with $10000 in his account. There are three common styles to setting that number of stock positions to have on your account. This limit is excellent for short-term traders who prefer holding a position for only a few minutes or hours. This rule is ideal for day traders. If you make intraday trades, you always have to focus entirely on a single trade to manage it properly. Having more than one (or a maximum two positions) opened simultaneously limits your reaction. Managing some bad situations, like a global market drop, intraday for more than two positions is extremely hard and often leads to losses in several trades at once. If you prefer a different trading style, you can use a higher limit. Check more below. Maybe you read reports from major hedge fund managers or mutual funds that hold more than 20 positions at the same time. Some of these funds have a broad portfolio and keep 30 to 40 opened positions at one time. This is not appropriate approach for you as a private trader. You would need a team to manage such a large number of stock trades. From research, through trade execution, till closing of the position, all these actions require many different people to handle them. If you want to make your trading quite simple and achieve optimal results, avoid having more than ten stocks in your portfolio at every point. The maximum amount of positions that a one-person team can handle is between five and ten. You can manage these trades simultaneously. If you’re swing trader or position trader, then this limit is ideal for you. I have set eight positions as my limit. I don’t reach this ceiling too often, the average number of simultaneously opened position in my account is smaller. This is the option I recommend and use myself. The first part is quite simple. You have to check the amount of opened positions continuously as you manage your trades. If you reach your limit, you know that you cannot open new position anymore. Knowing the limit is the first step. Knowing how to use it practically to manage your risk is the second. The limit also defines what is maximum position size for every one of your trades. 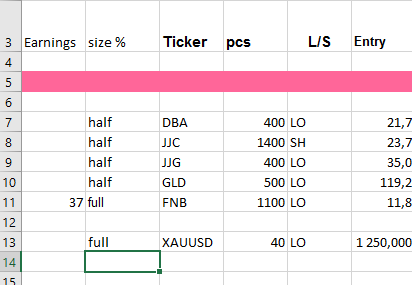 The simplest approach is to divide your account’s size by your limit to know the maximum amount of money you can allocate to a single trade. You can also add a margin loan size that your broker provides to you. So if your buying power is $100K and your limit is five positions, you know that every single position can have a maximum size of $20000. You can use a spreadsheet for easier calculation. You also have to use this condition together with all the other risk management rules to precisely define an ideal number of shares you can buy or short sell in any individual trade. Setting a wrong limit can cause you many headaches. It can urge you to make more trades than you should. It can push you to risk more than you need to. And finally, it will cost you money that would otherwise stay on your account as profit. Therefore always incorporate rules on how many stocks to have in your portfolio at once to your stock trading plan. Follow these rules without exception. Shorten your learning by avoiding swing trading stock mistakes.